The Signature of the Celestial Spheres invites you to a journey of discovery through our cosmic home and its hidden movement phenomena. 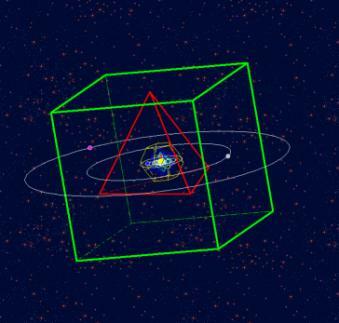 The program presents a powerful virtual planetarium with many, for a great part unique, representation and output options based on highly accurate calculations over several millennia in the past and the future. Your own experimentation will soon show you the functions of the software, but if needed the Help system will provide detailed information. In addition, the menu item Examples can be used to show you pre-defined planetary configurations and sequences through which you can familiarize yourself more closely with the heavenly order and the program and its possibilities. – Glossary of astronomical terms. 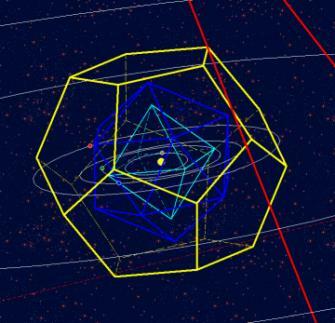 – Long-term simulations of the orbits. – Extensive collection of quotations about the cosmic order and the harmony of the spheres. – Date can be set (including Julian Days). – Extended control options via hot keys. Many exceptional program options (e.g. the representation of Keplers Mysterium Cosmographicum amid the orbiting planets); enlargement with zoom function on the right .